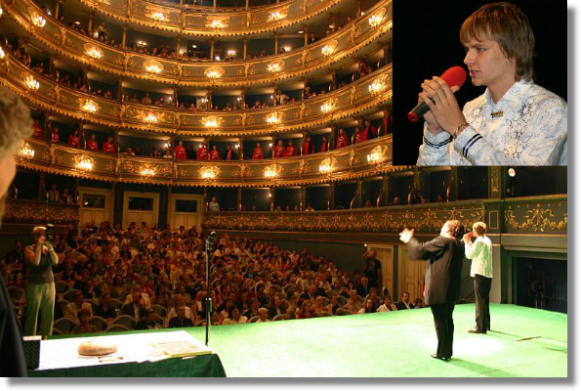 On Tuesday, June 10, 2008, at 14.30, the Theatre of Estates in Prague welcomed valuable guests – representatives of the companies and people who decided to help. How and to whom? Somebody by giving money, somebody by work… but always in places where help is needed – hospitals, creches, theatres, museums, Zoos. Richard Langer with his daughter Marketka were the masters of ceremony. H.E. Peter Nicolay Rader, Ambassador of Norway and Senator Dr. Richard Sequens, PhD were among the valuable guests. Board of the “D award” was choosing the winners of each category. The members had a tough decision to make. As all of them – Mrs. Bela, Dr. Ondrej Cerny, director of the National Theatre, Dr. Petr Fejk, director of Zoo Prague and Dr. Vladimir Koza, the founder and director of the Bone Marrow Foundation – agreed, they would love to award everybody who tries to help in all the ways. The decision was very difficult. The „Centipede“ part of the programme was introduced by Pepa Vagner and his hit „You give me the power“. Movement „On Own Feet“, represented by Mrs. Bela, announced 3 categories. More than 40 candidates were nominated. In the category “Centipede”: Centipede school in Roeren, represented by its director Ms. Else Marie Bomstad. During its work in the movement, the school earned more than 250 000,- CZK (10 000,- EURO). In the category “Ethics and national pride”: Mr. Jan Pikna, director of the international opera festival Smetana´s Litomysl, for presentation of the Czech music on the international forum. In the category “Role model of human help” – PhDr. Jiri Pan, director of the creche and Practical school in Volynì. For 9 years, Mr. Pan has been organizing the beauty pageant among and with this he helps the children to gain self-confidence and be a part of our society. Special award was presented to Dr. Oskar Andrysek, head physician of the hospital in Mesice u Prahy and member of the Order of St. Lazarus of Jerusalem, for his excellent and tireless work in the field of oncology. In the name of the Centipede children, Mrs. Bìla handed over a small present to the founder of the project of the “D award” as a token of appreciation and thanks to everybody who deserves support for his devoted work. The Centipede anthem „Never Be Alone“ sung by Pepa Vagner and children choir put a wonderful end to the whole afternoon.